Over the last three months, Emirates and the Jetman Dubai teams worked closely to diligently plan and coordinate every detail of this project. Armed with unguarded ambition and the vision to push boundaries beyond the unthinkable, Jetman Dubai and Emirates A380 take to the skies of Dubai for an exceptional formation flight. 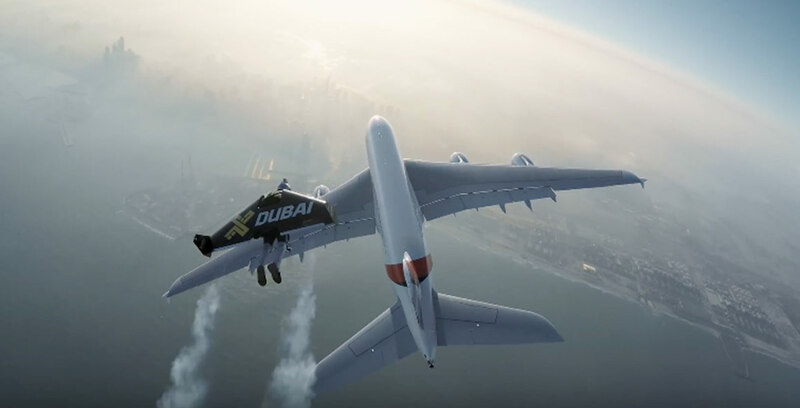 A carefully choreographed aerial showcase, conducted over the Palm Jumeirah and Dubai skyline, involving the world’s largest passenger aircraft and the experienced Jetman Dubai pilots Yves Rossy and Vince Reffet.